We've seen so many superheroes and vigilantes that start their journey by seeing their family murdered in front of them, you'd think that it would get a little boring. But it somehow worked itself out a little differently for Casey Jones. He saw his family murdered, but he didn't back down an inch. He took all his erratic energy and focused it into his new persona and new mission: to beat the crap out of the criminals of New York City. And the thing with Casey Jones is, the cliche beginnings don't take away from his character at all. In fact, it fuels it. It totally makes sense that a guy with a bad childhood and tons and tons of energy would eventually throw all of his weapons into a golf bag and take to the streets. It balances the Teenage Mutant Ninja Turtles out to have a crazy man fight along side of those who have been trained in the ancient arts of discipline and respect. And if you're the type who likes to cut loose and let your wild side show, maybe you'd be suited to dress up like Casey for Halloween. 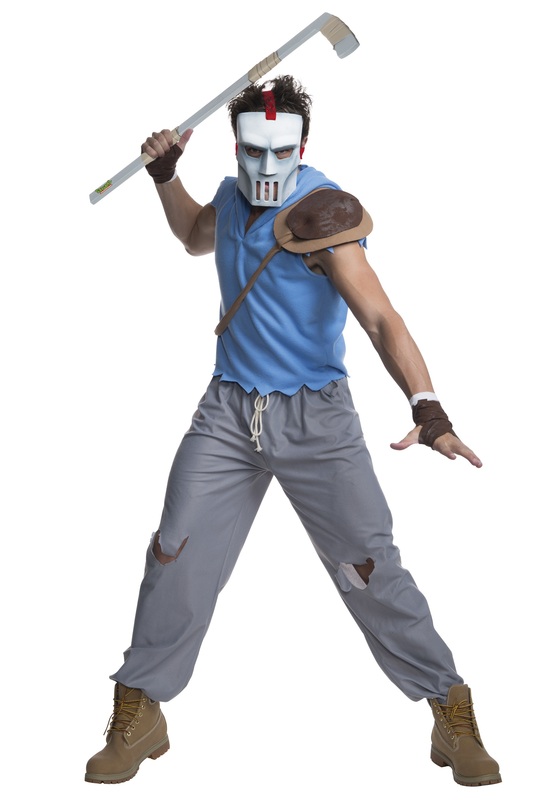 We'd suggest this adult TMNT Casey Jones costume. The 100% polyester fleece and polyurethane foam costume has a sleeveless pullover fleece hooded sweatshirt with a foam pad sewn to the left shoulder, and gray fleece pants with jagged edges and elastic at the waist and ankles. The molded plastic mask has an elastic strap around the top and sides of the head. Add a hockey stick or golf club to complete the crazy costume.